We're getting used to wireless control for toys like the Orbotix Sphero (see previous post), and wireless tracking with devices like the Tagg Pet Tracker (see earlier post). Yes, these are wireless light bulbs -- each bulb can be individually addressed from apps on your smartphone or tablet, so you can set the color palette of your room, animate the lighting with music, or even set them to respond to external events. Verizon Wireless kindly loaned me a set of the Hue lights to demo for my Holiday Gadget talks, and they were a big hit. I brought along three lamps with the Hue bulbs, and had a fun time showing how you can swipe on a smartphone display to change the colors, tap to make them flash like lightning, or talk into the phone to have them respond to sound. These are standard size LED light bulbs, so you can just screw them in to any open fixture. They're quite bright at 600 lumens, and can adjust a clean white from warm to cold as well as generate a wide variety of colors. And they use 80 percent less power than traditional light bulbs. These actually use a different wireless technology called ZigBee LightLink (IEEE 802.15.4), which you can think of as combining the low-energy, lower data rate efficiency of Bluetooth with the extended range of Wi-Fi, up to 300 feet. The Hue system therefore uses a bridge device that plugs in to your wireless router and bridges communications to the bulbs. You then can run apps on your smartphone or tablet, and control up to 50 Hue light bulbs on a single system. You can use the free Philips Hue app for iOS or Android to set the brightness and color for each individual bulb, select lighting scenes to set the mood (sunset, beach, skiing), and define your own light recipes. Then you can set your recipes to activate on timers (on / off at specific points during the day), or based on location (leave / arrive home). There are over 10 additional third-party apps available for the Philips Hue system, especially to animated effects. I used the Hue Party app for my demos, which includes strobe, flow, and candles effects, as well as animating a light show based on listening to your music. It's free to try out with two bulbs, with a $3.99 in-app purchase to support unlimited bulbs. The Philips Hue Starter Pack is $199, with three bulbs plus the bridge. Individual bulbs are $59. Philips also offers a LivingColors Bloom Lamp for $79 and 2-meter flexible Hue LightStrips for $89. This may be a bit pricy for everyday use, but you can clearly see the potential. As you design rooms in your home, you can extend the design with custom lighting to match the mood -- from relaxing to energized, quiet to partying. There's a bright future for these kinds of wireless-enabled components -- The Hue system also can link with other apps, so you can have your lights react to external events, from arriving mail or new photos posted online to changing weather or sports scores. See my Holiday Gadgets & Portable Accessories 2013 coverage for more on portable audio and other fun devices. 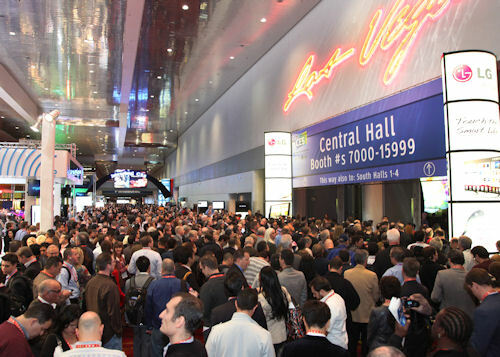 The International Consumer Electronics Show (CES) returns to Las Vegas this week, with the exhibition running from Tuesday, January 7 through Friday, January 10, 2014. The show is produced by the Consumer Electronics Association (CEA), which reports that CES continues to be the world's largest consumer technology tradeshow, the largest tradeshow of any kind in North America -- and the world's largest wireless event. Last year's CES had over 152,000 attendees packed into town, with over 36,000 international visitors from over 150 countries. And the show floor grew slightly to more than 1.9 million net square feet of exhibit space (equivalent to some 37 football fields), with some 3,200 exhibitors. Specific focus areas and Tech Zones for this year's show include automotive, Apple and other mobile accessories, digital health and fitness products, and emerging technology and startups. As in previous years, the gadget blogs and tech publications will be out in force at CES, with teams live blogging the new announcements for hot-off-the-press coverage. I'll update my annual summary document with links to these sources and other coverage of the show. 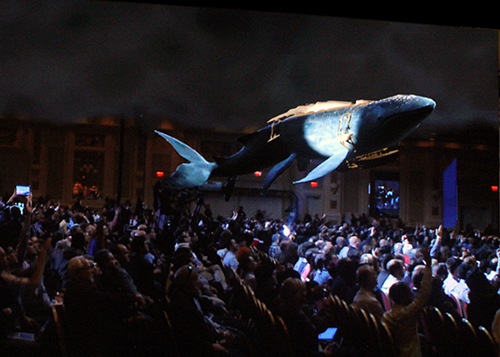 See my 2014 International CES Summary article for information on the show, facilities, Las Vegas, exhibits, conference program, and press events, plus links to more information and press / blog coverage. The 2014 edition of the International Consumer Electronics Show (CES) has wrapped in Las Vegas last week. The big push from the major CE companies were Ultra HD TVs (the next step up to "4K" resolution), and curved and even flexible TVs that provide a more cinematic experience. And the automakers were out in force with the next step in connected cars. On the PC side, Intel made a big push on 3D motion sensing with its RealSense 3D camera and software, and also promoted laptops that combine Windows and Android, to be ready for either more casual tablet use or intensive PC-focused use. But Intel's larger focus was on embedding processing into everyday devices, the "Internet of Everything," with the Intel Edison computer on a SD card (yes, literally on a SD card) and the Mimo wireless baby monitor integrated into a onesie baby outfit to sense its respiration, skin temperature, body position, and activity level. This emphasis on sensors was matched in the Digital Health and Fitness Tech areas, with a profusion of measurement devices and wristbands to track your activity level and monitor your vital signs. And to make your own stuff, the 3D Printing area on the show floor was very crowded, with cost-reduced and higher-res products, and more emphasis on providing collections of interesting models to print. The iLounge area with accessories for tablets and smartphones also was a major presence, with astounding varieties of cases, power adapters and batteries, and an unbelievable profusion of wireless speakers -- included some bottle-shaped models to ride in your backpack, bike, or car cup holder. But my favorite example of new technology leading to useful products is Finsix, which has developed new power switching technology from MIT. This doesn't sound so cool, but the first result is new power adapters that are 1/3 the size and 1/6 the weight of the existing bricks that you need to carry around with your laptop. These are due mid-year, and I can't wait. Action cameras are a great way to capture a first-person active experience, like biking, skateboarding, skiing, or driving. But you're basically shooting a one-hour video in one take -- albeit hands-free, from your head or from a vehicle. So you need to think about plannning your action along a path so that the final video works for the viewer, and take care to avoid jarring actions like suddenly turning your head. As a result, action cameras may not work well for capturing an event like a birthday party or a craft show where you want to explore a space. And they do not make sense for longer explorations, like a day-long hike through the woods or wandering along the shoreline. 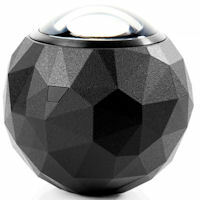 The VOXX 360Fly is a panoramic video camera that shoots the entire 360-degree scene. You then can play back the video from the iOS or Android app, pan around in the video as it plays, or view the unwrapped scene. It should be available around mid-year, at a price around $400 to $450. There's also a 360MicroFly model, which is a 360 degree optic lens attachment for Apple and select Android smartphones, to be priced at around $99. The Autographer intelligent wearable camera shoots a sequence of still photos, so, you can capture your experience over a long time, with on the order of 2000 photos over a 12-hour period. The Autographer intelligently uses five sensors to decide when to automatically take photos, based on color, temperature, acceleration, compass direction, and IR motion. Plus it has built-in GPS to geotag your images with location information. You then can use the smartphone or desktop software to create stop-motion videos with music before sharing online. The Autographer is priced at $399, and is available in black or trnaslucent cases, along with rugged cases and mounts. Entries posted to Manifest Tech Blog in January 2014, listed from oldest to newest.